This mousse takes only 15 minutes to prepare and can easily be made in advance. It's a perfect light dessert to top off a rich meal. This mousse takes only 15 minutes to prepare and can easily be made in advance. It's a perfect light dessert to top off a rich meal. Love this recipe? Check out Marisa Churchill's cookbook Sweet & Skinny: 100 Recipes for Enjoying Life's Sweeter Side Without Tipping the Scales for more low-fat, low-sugar recipes to keep you slim while satisfying your cravings! Melt the chocolate with 2 teaspoons of water in a double boiler or in the microwave until you can stir the mixture smooth. 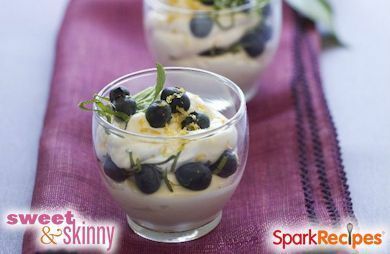 In a medium bowl, whisk together the whipped topping and yogurt. Whisk in the melted chocolate and the lemon zest. Divide the mousse evenly between four 4-ounce dessert glasses. Divide half the berries and half the basil evenly among the glasses. Spoon the remaining mousse over each and top with the remaining blueberries and basil. Serve. To prepare in advance, refrigerated, tightly covered, for up to 2 days.